Summer is nearly here and that means vacations for a good many people. I usually fly once a year between Christmas and New Years. Last year, I saw an unusually high number of dogs at the airport, and I was particularly surprised by how many of them were just walking through the terminal on a leash rather than carried in a secure pet carrier. Once I was on the plane, a lady boarded with her small breed dog in a carrier. As people continued to file on board, Lil Pup began to share, with all of us, her opinion of air travel. The high-pitched squeaking/whining was so intense that a flight attendant walked back to speak with the owner. Thankfully, Lil Pup settled down shortly thereafter and we didn't hear a peep from her again, but it made me realize how important it is to prepare your dog for flying. Crate Training. If your dog cannot comfortably rest in a crate for several hours, that's a big problem! One of the easiest ways to start crate training is to feed at least one meal per day inside the crate. Use the same style crate you'll be using on the plane, and make sure that he can also comfortably rest without a food puzzle or chew as these might not be allowed through security. How to tell if he's comfortable? There should not be any kind of vocalization (whining, shrieking, or barking), heavy panting, or restlessness. Crate training is a process and your dog determines how long it takes. If he is greatly distressed in the crate, consider leaving him home and hiring a sitter to stay at the house with him while you jet-set. Vibrations. Resting in a crate at home is different than resting in a moving plane! This element is trickier to practice beforehand, but riding in a moving vehicle is better than nothing. Buses take the vibrations up a notch, so take advantage of that if their pet policy allows it. Note: it's important that your dog be comfortable in the crate at home before trying in a car. Leash Manners. If it's not against the terminal's policy and you plan to walk your dog through the terminal on-leash, that needs prep too. Use a casual heel to keep the dog from disturbing other customers in public places (video); a 3.5 to 4 foot leash is also helpful (please don't use a retractable!). 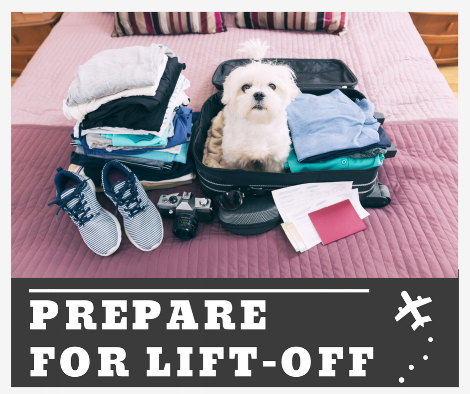 Remember that you'll also be carrying a personal bag, a carry-on and your dog's carrier in addition to holding the leash. Make sure to practice with all those extras! A relaxed and comfortable heel in a crowded place takes time to achieve so get started well before your date of departure. Watch this video to see the beginning steps for training a casual heel. Crowds. Airport terminals are usually very crowded places. Some dogs have a really hard time with this--they either reactive "aggressively" with barking and lunging or they withdraw into a silent panic attack. It's very important to correctly observe and identify dog body language to determine how your dog feels in a crowded environment. Lowe's Home Improvement is a great pet-friendly place to evaluate how your dog feels about crowds. Some Home Depots are also pet friendly as well as Half Price Books and Ross stores. BONUS: Settling. Have you ever been surprised to discover a service dog team sitting one table over? Hopefully, the dog was so unobtrusive that you didn't even realize he was there until they got up to leave. A large part of what makes that work is something called, "settling" and it's about teaching dogs to relax despite a distracting environment. Pet dogs can work on it too, and it's a stellar idea for dogs who will be flying. Some of favorite ways to work on it is with the Relax on a Mat protocol or the Protocol for Relaxation. "What about flying cargo?" We don't recommend it. It's a very scary process for dogs and the chances of your pet getting lost, injured or sick is very, very high.